‘I Elias Ashmole, was the son (& only Child) of Simon Ashmole of Lichfeild Sadler eldest son to Mr. Thomas Ashmole of the said Citty Sadler, twice cheife Bayliff of that Corporation, and of Anne one of the daughters of Anthony Bowyer of the Citty of Coventry draper, & Bridget his wife only daughter to Mr: Fitch of Ansley in the County of Warwick gent. I was borne the 23rd of May 1617 (& as my deare & good Mother hath often told me) neere halfe an houre after 3 a’clock in the Morning.’ Thus, at the beginning of a set of autobiographical notes, Elias Ashmole wrote of his birth four hundred years ago today. In celebration of this event, EMLO is delighted to announce the publication of a new catalogue containing a calendar of his correspondence. 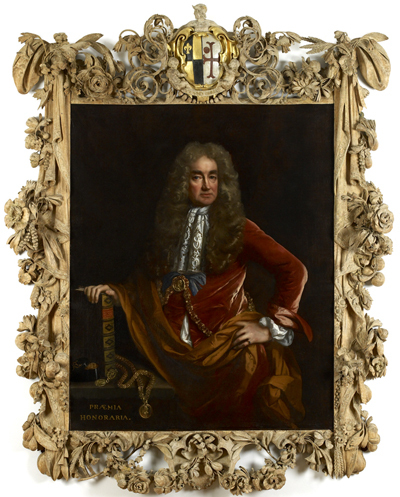 Ashmole is a complex character known best as a collector, an antiquary, and the founder of Oxford’s Ashmolean Museum. But he was also a freemason, an inaugural Fellow of the Royal Society, an astrologer (with a particular interest in alchemy, publishing Fasciculus chemicus in 1650, Theatrum chemicum Britannicum two years later, and The Way to Bliss in 1658), as well as an officer-of-arms and herald, and the Comptroller, and later Accountant-General, of the Excise. He began his working life as a lawyer. Many of the events that befell him we know only from his own account in a document preserved among his papers in the Bodleian Libraries (MS. Ashm. 1136, fols 2–98). For one-hundred-and-thirty years after his death, this manuscript was considered to be a diary. It took the eighteenth-century antiquary and diarist Thomas Hearne (whose own correspondence plays such a crucial role in the early years of the Bodleian’s analogue Index of Literary Correspondence) to observe: ‘It is most wretched Stuff, and put down by Mr Ashmole only as private Memorandums’.1 And Hearne was right: it is a predominently chronological listing of autobiographical notes compiled in the years from 1678 when Ashmole was sixty-one. The register continues until 1687, five years before his death, and must have been intended as the outline of an ultimately unwritten autobiography. 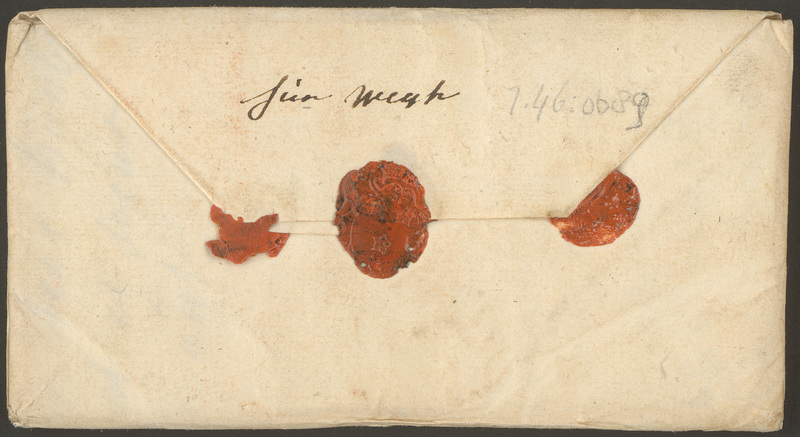 It is from these jottings that Helen Watt — who worked from 2009–12 on the correspondence of the Ashmolean’s second keeper, Edward Lhwyd — has teased out this calendar of correspondence. Far from straightforward work, it is the first time that the metadata for Ashmole’s letters have been set out in this way. Working in partnership with Oxford University Press — the publisher of C. H. Josten’s 1966 ‘monumental edition of materials relating to Elias Ashmole’ (as described by Charles Webster)2 — and with its digital resource Oxford Scholarly Editions Online [OSEO], Helen has linked the records of letters in EMLO to the online edition and has supplemented the body of letters to be found in Ashmole’s listings with detailed calendaring of a set of prognostications on the weather (Bodleian Libraries, MS. Ashm. 368). These forecasts were sent monthly to Ashmole for twelve years from 1677 by John Goad, the headmaster of the Merchant Taylors’ School in London. What has been drawn together in EMLO is in the main a subjective calendar; we have been able to record only what Ashmole wished to remember. Correspondence that relates to his dealings with the Tradescants is missing, for example, as is that concerned with a number of law suits in which he was involved, but this calendar is a start and as additional letters are brought to our attention, we will augment the catalogue. 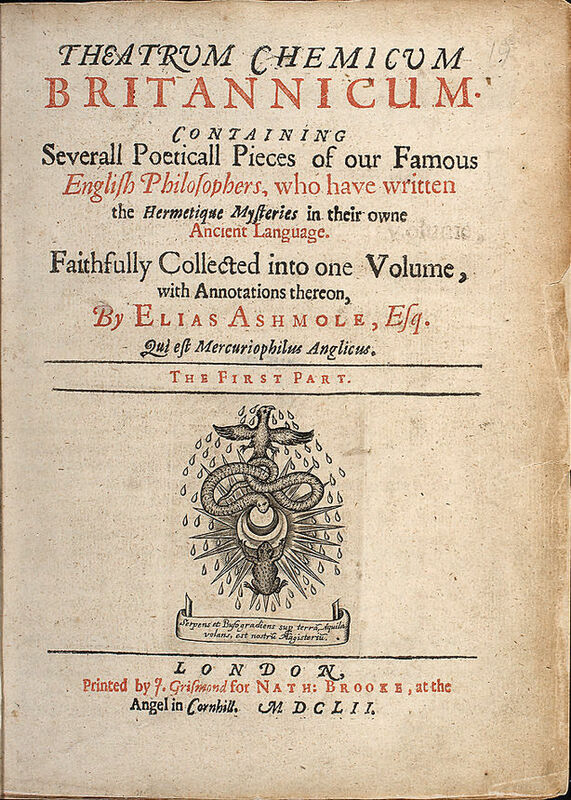 For EMLO’s users who are interested in alchemy, in heraldry, in the history of collecting, or in early medical practices (Ashmole was a meticulous note-taker when it came to his own health), it’s well worth sinking into a chair in a OSEO-subscribing library and following the links from each letter record to Josten’s edition online. For it is here you will find a myriad of choice snippets. Consider, for example, the following remedy Ashmole availed himself of on 11 April 1681: ‘I tooke early in the Morning [a] good dose of Elixer, … hung 3 Spiders about my Neck … they drove my Ague away, Deo gratias.’3 If only more conditions were cured this easily! I’m extremely glad, Mr Ashmole, that you survived such self-medication to live another eleven years. Happy four-hundredth birthday! This entry was posted in Uncategorized on May 23, 2017 by Miranda Lewis. We are delighted to announce the award to the University of Oxford of a fourth round of funding from the Andrew W. Mellon Foundation in support of the Cultures of Knowledge [CofK] project. 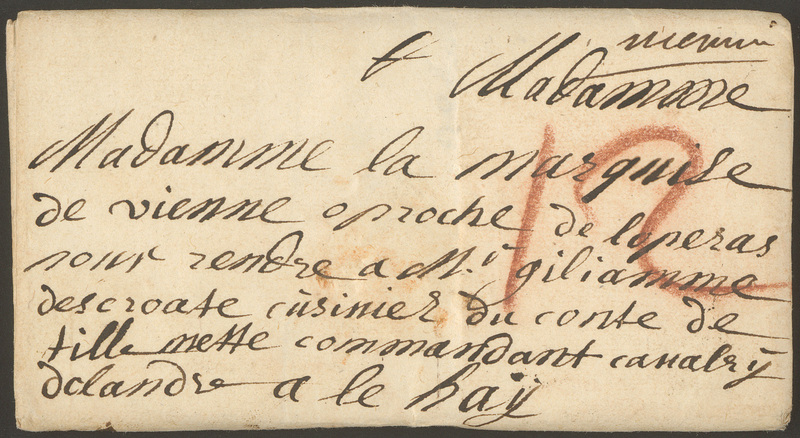 The grant of $393,000 will support continued work on Early Modern Letters Online and Cultures of Knowledge to the end of June 2019. Once again we are deeply grateful to the Foundation — and to all our partners, contributors, and team members — for their support and confidence in this project. Phase IV of Cultures of Knowledge will build on work completed in Phase III to advance the collaborative development and population of Early Modern Letters Online [EMLO]. First conceived as a monolithic system designed, built, and populated in Oxford, EMLO is evolving into a central component of a distributed, transnational digital infrastructure designed, built, and populated in concert with European and international partners. In the next phase, CofK will take a further and important step forward towards this goal by disaggregating the basic components of EMLO’s letter records. The outcome will be a new set of Linked Open Data resources for tackling the complexities of early modern people, places, and dates to complement EMLO’s existing systems for handling early modern epistolary metadata. Hitherto CofK has regarded letter records as its primary concern, and person and place records as integral components of these letter records. Yet a letter record is not elemental: accurate letter metadata rely on the accurate identification of people, places, and dates. Each of these identifications raises considerable difficulties that must be confronted if a large-scale digital infrastructure is to be firmly founded. Dating early modern letters accurately requires systems for mastering a complex landscape in which places transition between different calendars at different times. Accurately recording early modern letters requires capturing data that describes changes over time in how places are both named and nested within larger geographical entities. Confidently identifying letter writers and recipients requires the development of authority files for huge numbers of early modern individuals who are not found in national biographical dictionaries or library catalogues. CofK’s main agenda during Phase IV will be (1) to decouple our systems for handling early modern people, places, and dates from the core system for handling letter records; (2) to define new capabilities for these systems on the basis of eight years of experience and dialogue with a wide range of partners; (3) to launch Early Modern People and Early Modern Places as free-standing, Linked Open Data resources that will be capable ultimately of being used and populated independently of EMLO; (4) to launch Early Modern Dates as a free-standing web-service able to reconcile multiple calendars; and (5) to integrate and interlink these databases with EMLO and other relevant Linked Open Data resources. EM People, Places, and Dates will be developed in close collaboration with CofK’s partner, the Huygens ING, on the basis of a humanities-focused, Linked Data-capable IT infrastructure. EM People will be populated initially by the c. 25,000 unique early modern biographical and prosopographical person records collected thus far by Cultures of Knowledge for EMLO. EM Places will be a Pelagios-compatible, historical gazetteer with support for temporal places, drawing on the c. 5,500 disambiguated early modern place records recorded in EMLO. EM Dates will serve primarily as a web-service and API for converting across the range of early modern calendars. 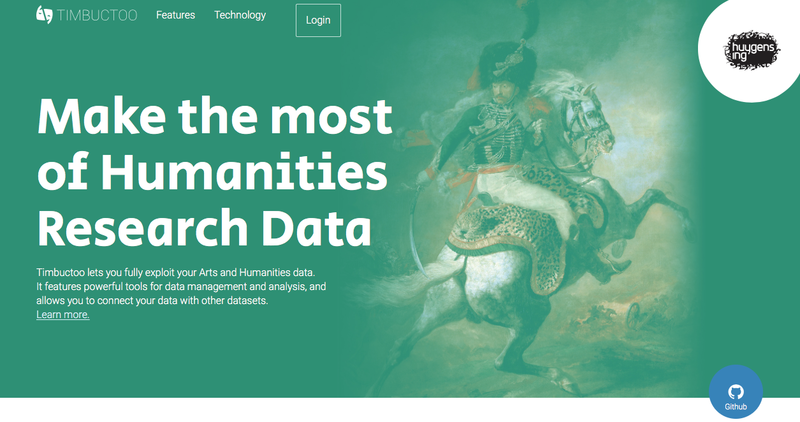 We are confident that the release of these new resources alongside EMLO will benefit not just Cultures of Knowledge but also a far wider community of early modern digital projects. In parallel to our central agenda, we will continue to advance and strengthen the scholarly, technical, and networking priorities we pursued during Phase III of the project. Of these, the most important has been the regular addition of new correspondence catalogues to EMLO. In April 2015, at the beginning of Phase III, EMLO offered access to c. 61,000 letter records. Today, at the start of Phase IV, this number has doubled — EMLO provides access to c. 120,000 letter records across eighty-two correspondence catalogues. Letter records can be explored now by catalogue, theme, or contributor (with further entry points by chronology, geography, and repository in preparation), and filtered by gender. New correspondence catalogues will continue to be added to EMLO during Phase IV, albeit at a slower pace than in the recent past. In addition to new catalogues, CofK plans to add further virtual exhibits to EMLO. 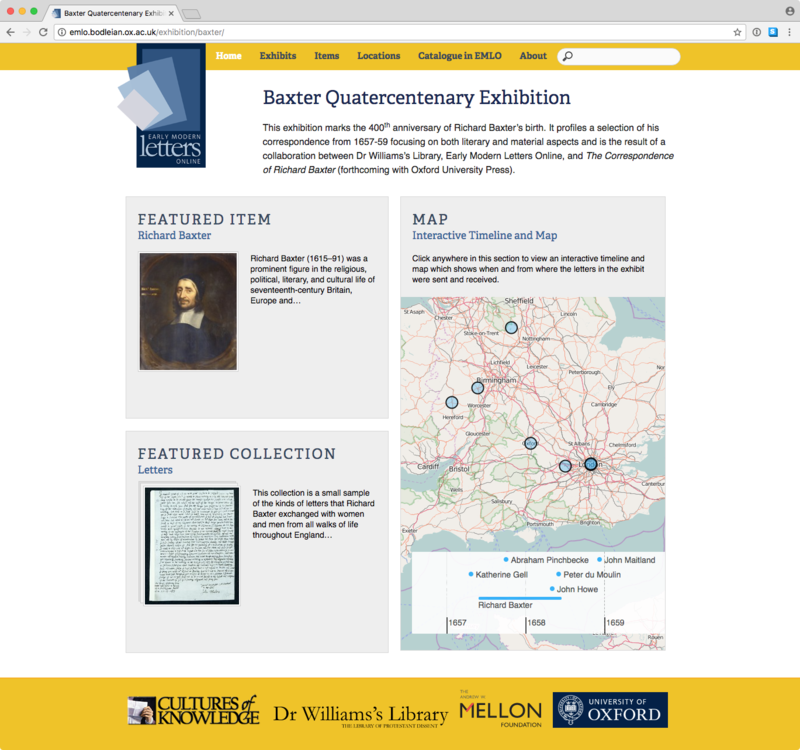 Two inaugural exhibitions were created during Phase III: the Baxter Quatercentenary Exhibition marked the 400th anniversary of the birth of Richard Baxter and profiles a selection of his correspondence from 1657–9, while the second highlights the correspondences of the wives of six seventeenth-century Dutch stadtholders. In Phase III, we made it easier for scholars and researchers to contribute letter records to EMLO by creating a custom webform for adding metadata online. This tool is already in active use by a significant number of different projects and individual contributors, including our own students at Oxford, who are learning (together with the Bodleian’s Department of Special Collections and Centre for Digital Scholarship) to transcribe manuscript letters and to contribute data to EMLO’s Bodleian Student Editions catalogue. In Phase IV we expect to continue improving the valuable disambiguation and de-deduplication tools developed in close collaboration with our partners at Aalto and Helsinki Universities. We have also explored several means for exporting and visualizing both epistolary and prosopographical metadata from EMLO. 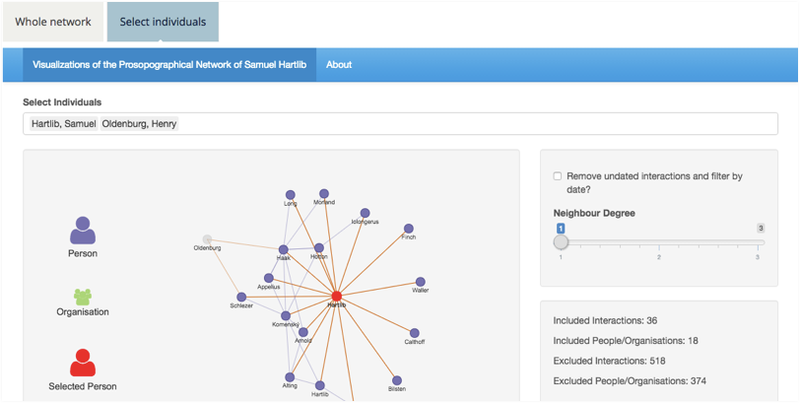 One outcome of this work is a case study of the prosopographical networks of Samuel Hartlib and Jan Amos Comenius which can be viewed on the website of the Interactive Data Network group at Oxford with whom we partnered on this project. A full write-up of this project will be posted on the CofK website in the coming months. A second experimental visualization, still under construction, offers a temporal perspective on our published catalogues. In the course of Phase IV we expect to expand and intensify our activities in these areas. In conjunction with our development of EM People, EM Places, and EM Dates, we plan to organize a small number of focused workshops for invited scholars, librarians, and researchers to review the capabilities of these databases. In Phase III, we hosted the members of the Signed, Sealed, and Undelivered project for a workshop on letter-locking and to develop metadata standards to record the unique characteristics of the Brienne Collection in EMLO. In fact, we have been very fortunate, throughout Phase III, to be able to draw on a wide network of established experts and early career scholars to help advance our work. This was made possible under the auspices of the EU COST Action IS1310, ‘Reassembling the Republic of Letters’, also chaired by Howard Hotson. The COST Action has allowed us to meet regularly with scholars, librarians and archivists, IT specialists, and designers to exchange ideas and prepare shared standards for what we hope will emerge from EMLO: a state-of-the-art, transnational, distributed digital infrastructure for early modern correspondence. We look forward to participating in several more such exchanges before the COST Action completes its work in the summer of 2018 with the publication of a volume documenting its recommendations. We hope this brief summary offers an introduction to the main goals for the next phase of our project, while highlighting the many areas of continuity from Phase III. Please do be in touch to share your feedback and ideas about these plans — we value your feedback greatly. To keep up to date with the latest news and updates from Cultures of Knowledge, please follow us on Twitter (@cofktweets), sign up to our (low traffic) mailing list or contact us directly at our project office: Cultures of Knowledge, History Faculty, University of Oxford, George Street, Oxford, OX1 2RL, U.K.; tel. +44 (0)1865 615026. This entry was posted in Uncategorized on May 19, 2017 by Arno Bosse.